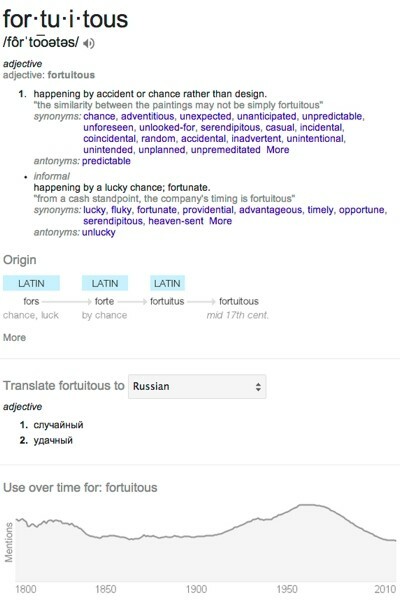 In addition to the standard definitions that are already available, search queries like "define fortuitous" will not only bring up the meaning of the word, but also provide synonyms, translations, origin and sample sentences, among other things. The new features seem to be working on most words, although some reports have said that more obscure or lesser used terms don't yield as much info. The new features are also integrated into Google's voice search. "If you tap the microphone on your Google Search app, you’ll hear answers spoken back when you ask questions like “What’s the definition of fortuitous?” and “What are synonyms for fortuitous?” the company's Google+ post read. After you've chosen to translate a word to a certain language, Google says your future definition searches will automatically provide you with translations to that same language. The feature is available on both desktop and Google's mobile search apps, but for whatever reason only users in the U.S. will be able to see the expanded word definitions initially.